Even though Bitcoin was the first cryptocurrency that was introduced back in 2009, it didn’t gain much popularity until 2017 when it helped its investors make a fortune overnight. The pioneer cryptocurrency hit its peak and led to the reversal of fortunes for many. Since then, this investment vehicle has become a hot commodity and has led to the introduction of several other cryptocurrencies in the market, such as Ethereum, Ripple, Litecoin etc. If you are interested in trading cryptocurrency, you need to sign up on a cryptocurrency exchange where they can be bought and sold. However, these exchanges have been subject to hacks and other cybersecurity issues in the past so you have to be cautious in making a choice. For traders who want to start with buying and selling Bitcoin and Ethereum, the two top cryptocurrencies in the market, there is no better choice than Cryptoniqa. This cryptocurrency exchange has successfully gained recognition in a short span of time. Currently, the exchange offers traders the opportunity to buy and sell Bitcoin and Ethereum, but more cryptocurrencies are expected to be added soon. There are several reasons why Cryptoniqa has attracted the attention of traders, even though it specializes in only Bitcoin and Ethereum. The most prominent one is the fact that it offers some of the best market rates for both cryptocurrencies, something that other exchanges have not been able to do. Secondly, it has also made its platform accessible to traders by making the signup process simple and straightforward for everyone, no matter what their experience in the market. The exchange caters to traders of all skill levels and backgrounds and provides a hassle-free and smooth trading experience from the get go. In order to get started with trading via Cryptoniqa, traders are first required to make an account on the exchange. This is most definitely not a complex process as you just have to enter a few personal details like your name, email address etc. You have to be at least 18 years of age to make an account on the exchange. Plus, proof of identity i.e. a government issued ID card, passport or driving license has to be presented and proof of address i.e. a bank statement or utility bill needs to be submitted to verify your account. Account verification is important because you will not be able to deposit or withdraw money without it. After you have created your account and linked your bank account with it, you can start with buying and selling cryptocurrency. Traders should be aware that they are only allowed to create one account on Cryptoniqa and provide accurate information for this purpose. Any attempt to create a second account may get both accounts cancelled. Furthermore, there is no need to stress about the security and safety of your personal information that you hand over to Cryptoniqa as the exchange uses tough security measures to ensure your peace of mind. They have the strongest encryption and firewall in place to keep your information out of the hand of third parties. All account activity is measured and you will receive notifications and alerts via SMS and email about any changes. They also keep an eye on your wallet and have implemented Know your Customer (KYC) and Anti-Money Laundering (AML) policies to prevent any fraud or misappropriation of funds. While trading can be profitable, there is a cost associated with it and this can vary for every cryptocurrency exchange. Some exchanges have very high fees or commissions that can be a huge turn off for traders, but the same doesn’t happen with Cryptoniqa. Moreover, the exchange doesn’t believe in charging any hidden fee for a transaction, a common practice amongst other exchanges. When you trade on Cryptoniqa, you will have to pay 4.7 percent in fees and this is inclusive of Value Added Tax (VAT). 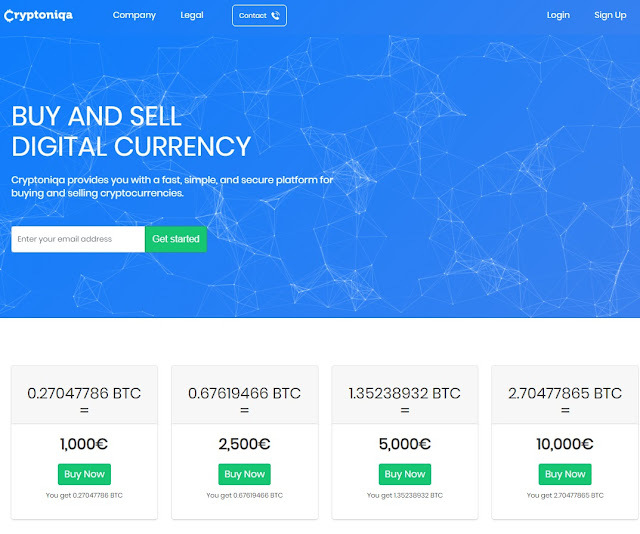 One advantage of Cryptoniqa is that it has some of the most competitive exchange rates to offer in the market that are not available elsewhere and can lead to some profitable transactions. However, you should take note that the rate is finalized after the order is made and payment processed. Before that, it may be subject to change as per fluctuations in the market. It is not possible for an order to be cancelled, if the payment has been processed. Up until payment process, you have the option of changing your mind. After you have placed your order for the cryptocurrency, it will take anywhere between 2 and 5 days for the transaction to be processed and for you to get your purchase. This is due to some rules and regulations that have to be followed. You should remember that your account needs to be verified for you to be able to make deposits and withdrawals. There are nearly 13 payment methods provided by Cryptoniqa for the convenience and ease of its users. This includes common methods such as bank wire transfers, debit and credit cards including both Visa and MasterCard. Apart from that, online payment solutions such as Neteller and Skrill are also supported by the exchange, which can lead to quick transactions. Clients are a priority for Cryptoniqa and this is obvious by the customer support options that the exchange offers. Traders can get in touch with the exchange by the use of the online form it has provided on its website or they can also send a comprehensive email, if they wish. Last, they also have a phone number that can be used for reaching out to them for any immediate problem and it is available 24/5. The agents are friendly and responsive and do their best to resolve your issues as quick as possible. Cryptoniqa is currently serving traders in more than 63 countries around the world and is expanding its user base on a daily basis as it is a comprehensive solution for fast and secure cryptocurrency trading.